Volcanic lightning is a visually incredible, naturally occurring phenomenon that has been witnessed and documented in nearly 200 eruptions over the last 200 years. The most recent images of volcanic lightning that occurred at Eyjafjallajokull have generated a lot of interest worldwide and allowed people to witness volcanic lightning for the first time in real time and high definition. 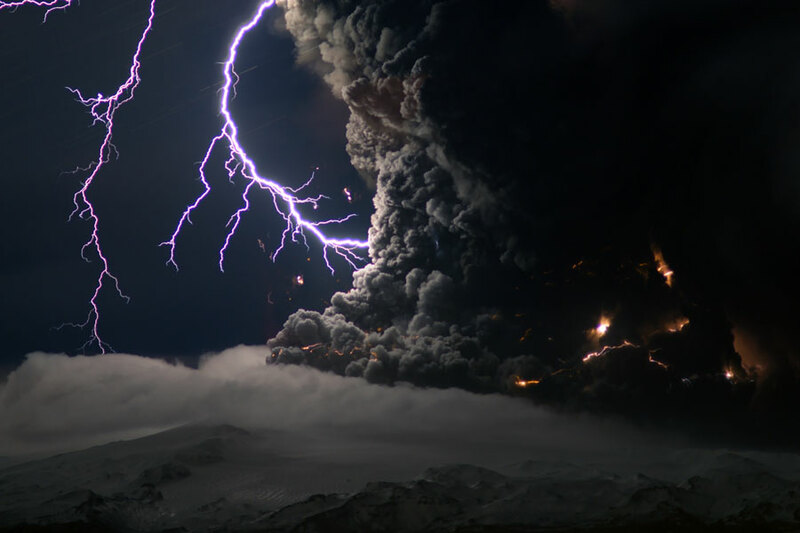 How can a volcano create lightning? Why is volcanic lightning often contained within or in close proximity to the ash plume? What types of eruptions are most conducive for the creation of volcanic lightning? These are all good questions, and in order to answer them we must first look at the physics that makes it all possible. In order for lightning to form there is one key component; a large charge separation between two masses. If the charge separation becomes big enough it is then able to overpower the air resistance, create a path of ionized air, and conduct electricity in the form of lightning. The ash that is to be erupted begins as electrostatically neutral rock or rock fragments. Heat and movement within the volcano is thought to be the first source of particle charging, although the main process by which ash particles acquire a charge is friction. When an object (in this case ash) with a neutral charge comes in contact with another object with differring elctrostatic qualities, electrons can potentially flow and one of the objects can become charged relative to the other. Think of skidding your socked feet rapidly across the carpet or rubbing a ballon quickly against your head. The same type of charge is accumulating within the ash cloud, only on a much larger scale. Eruption of Chilean volcano Chaitin May 6, 2008 Photo: Gutterriez C.
The lightning itself may come in many shapes and forms including St. Elmo's fire(ball lightning), bolt lightning, sheet lightning, or a combination as was the case during the eruption of Mt. St. Helens in 1980 when several people witnessed long lasting shows of sheet lightning which was accompanied by volkswagen sized St. Elmo's fire bouncing and rolling on the ground nearly 25 miles from the volcano.